More than ever, companies are desperately looking for candidates with Big Data and related technologies skill sets. They are determined to use a technology stack that generates benefits from data, whether transferring, acquiring, storing, curing, mining, processing or analyzing it. Theoretical knowledge but also working knowledge of technologies is essential. The first question in an interview is often, “What are you currently working on?” or “What kind of projects have you worked on?”. Answering these questions often make earnest professionals nervous unless they have already been part of a working environment that allowed them to work on a real-time business case. In the Capstone Project module of our course, we intend to simulate a real-time use case and provide you an opportunity to confidently go-ahead and say “Yes, I have worked on …….”. You will have an opportunity to learn the methodologies followed in the real world of Big Data & Analytics…to learn real-time use cases…and be able to implement a solution that caters to what companies need. 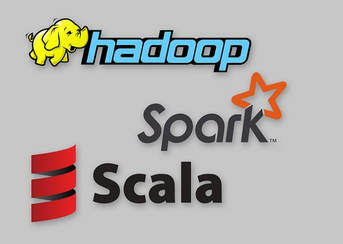 Every participant in the Hadoop, Spark and Scala course may select a project from a supplied project list, or propose a project of their own to the instructor. Implementation of the project solution may be implemented in any programming/scripting language, however usage of Scala and Java will be emphasized. Once participants have chosen the project, they will be grouped into a team to simulate a real time environment, mentored on methodologies to follow, and guided on techniques to implement a solution. When this is completed, more projects with solutions will be shared so that more use cases can be learned. Marketing Survey Analysis for a banking client using Spark and Data Frames. Grouping of customers into a pre-determined number of groups for a Telecom service provider using Spark, Scala, Data Science Models, Machine Learning and Hadoop. Batch-oriented and streaming data analysis for a retail giant using Hive, Spark, Spark Streaming and Spark SQL. Technology Stack: Big Data Hadoop and its ecosystem, Spark and Scala, data science models, machine learning concepts, Python and Java as optional.